The points provided can be used for purchasing. 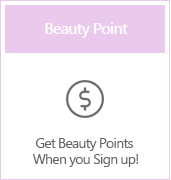 Check your point in "My Account" and use it on any purchase during checkout! 1. With the exception of refunds, all (purchase and review) points expire after 12 months. 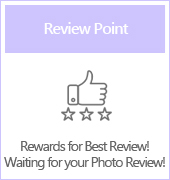 Reviews can be written two weeks after the initial delivery date. Each point is equivalent to $USD. Points will be rewarded accoring to the amount purchased. However, orders paid with coupons or points are excluded. 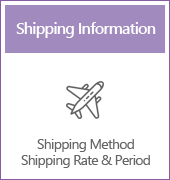 The points will be deposited two weeks after initial delivery date. 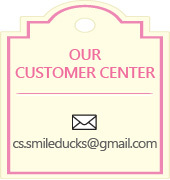 SMILEDUCKS limits an order amount less than USD 200 except shipping cost. Customers who may want to order more than USD 200, we recommand to make two orders and checkout separately. SMILEDUCKS accepts major international credit cards including Visa, Master, American Express. Customers’ bill page is run by Paypal payment module which is the most reliable payment method currently. Payment page is redirected to Paypal Webpage and you simply enter Paypal I.D and password and click “pay”. Paypal will show if payment is O.K or not, and you come back to our page and check your order status. If you proceed the payment, page will be redirected to Paypal Webpage. You choose the button “Pay with a debit or credit card, or Paypal Credit” on right side of window. Fiil in all required information and press “Pay”, then all process are finished. If payment failure is incurred, you come back to SMLIEDUCKS Webpage, and go to “My account” to check your order history. From the your order list, you click the failed order and proceed payment again.